Cotton output for the year 2018-19 (November–October) is expected fall way below initial estimates, according to trade sources. They say crop arrivals in early January are a fair measure of the estimated output, and that the current arrivals suggest a drastic decline in output. The cotton year starts on November 1 and ends on October 31 the following year. The Cotton Association of India (CAI), an apex trade body, had pegged the 2018-19 cotton crop at 34 million bales a month ago, down from 36.5 million bales in 2017-18. However, recent arrivals have been dismal, with the total this season standing at only 11.5 million bales, down from 16 million bales last year, indicating that the crop is much lower than earlier estimated. "This means cotton import will rise to a record high. We estimate an import of 2.7 million bales in the current year as mills will need thr fibre,” said Atul Ganatra, president, the Cotton Association of India. So far import has been a few hundred thousand bales but it is likely to pick up, given the latest scenario. The year began with a lower opening stock of 2.3 million bales compared to 3.6 million bales last year. If the estimates come true, mills will be forced to import at whatever cost to keep their factories running. Exports are also expected to shrink to 5.3 million bales this year, from 6.5 million bales the last ear. However, in view of the lower crop, if exports take place as estimated, the prices of domestic and imported cotton will remain firm. India’s total consumption in the current year is estimated at 32.4 million bales, which is almost the same as last year. 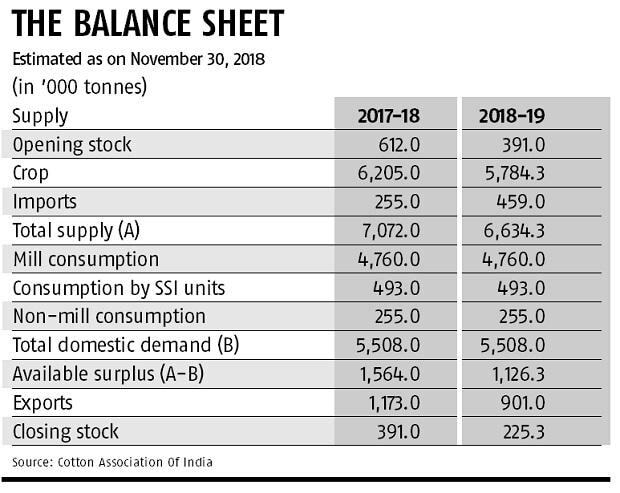 "Hence even if exports come down to 5.3 million bales from 6.9 million bales last year, as estimated by the CAI, import in coming months will accelerate and could hit a record high,” says Ganatra. While total exports in first two month of the season stood at one million bales, about 800,000 bales of the fibre are expected to leave Indian shores in January. This quantity was in any case contracted earlier. Prices in the international market have fallen sharply the past one month, which raises concerns for exports in the immediate future. 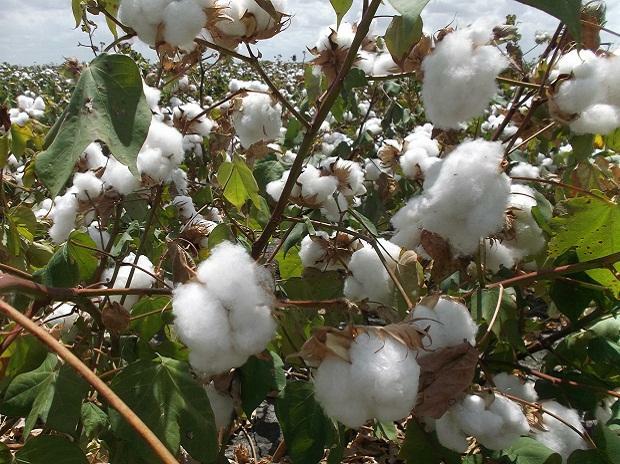 US Cotton is down 8.2 per cent since the start of December, and the Cotlook A index, which is made up of prices of 18 nations including India, US and some African countries, has fallen 6.6 per cent. However, prices in India are not falling in tandem. Shankar-6 price has fallen only 1.2 per cent, reflecting lower arrivals. It is to be seen whether US cotton, the benchmark for price, recovers from here. The International Cotton Advisory Committee said today that it sees prices moving in a range of 76 cents to a dollar with the mid-point at 86 cents. This means prices should go up from current level, increasing the competitiveness of Indian exports. Desai, however believes that the world cotton balance sheet is substantially tight compared to last year and hence demand and supply suggests that the seasonal lows of the last year should not be breached. "If the last season's low levels are breached, it would be due to factors outside the fundamentals of the commodity. The ongoing trade war between the world’s two biggest economies has brought the global economy on the verge of another financial meltdown. This has a direct bearing on cotton textile consumption and demand. If global cotton prices breach and sustain at last year's low levels, there is a high chance of this event materialising,” she says. In such a scenario, if India’s exports also remain lower that estimated, imports will also not rise as mills will get domestic cotton.